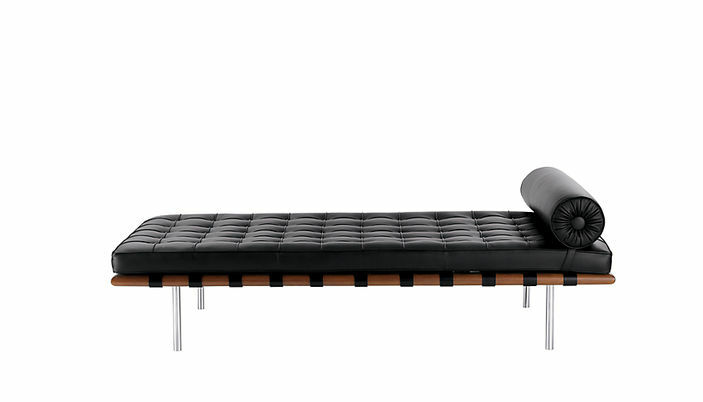 Perhaps one of the best-known forms from the 20th century, the Barcelona Day Bed or Daybed was specifically designed by Mies as part of a collection for the Barcelona Pavilion in 1929. Knoll acquired the exclusive rights to produce this collection to Mies' exacting standards. The Barcelona Daybed features an African Sapele Mahogany wood frame on stainless steel legs hand-buffed to a mirror finish. With the various Spinneybeck leather upholstery choices, all pieces to create the daybed are from a single cowhide and each is hand-welted and hand-tufted. Measures: 78" x 39" x 25" height; seat height 16.5"; bolster height 25"